Dog and exercise enthusiasts rejoice! There’s a meetup group in Concord that takes its members on a journey through the area’s beautiful trails, all while sharing the experience with their lovable pooches. One of the group’s organizers, Lorraine Courtney caught up with us to chat about the benefits of the group, how you can get involved, and of course, the pups! Around Concord: Please tell me again what the official name of the group is. When did it come about? How did you/the founders come up with the idea to put it together? How has it evolved over its lifespan? 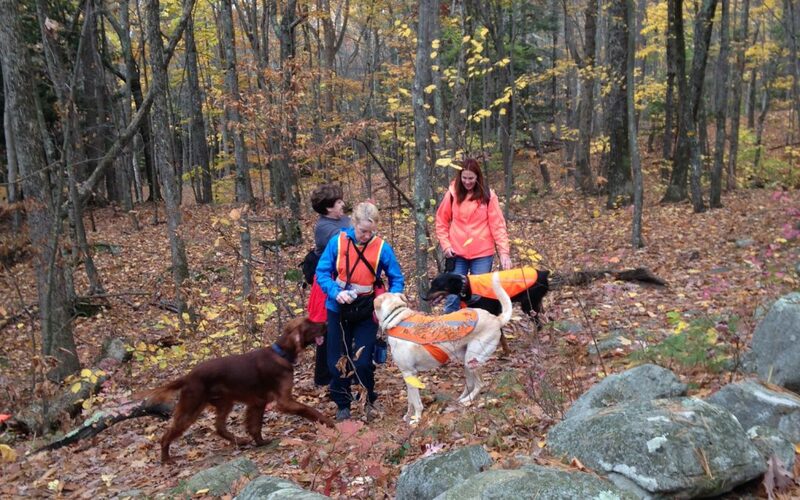 Lorraine Courtney: “Concord Walking for Your Fitness and Your Dog’s Fitness.” We started in June 2014 with a simple goal: to get our dogs outside enjoying the summer weather and nature while socializing with other dog lovers. I wanted to stay local in and around Concord. The only requirements for joining the group are that your dog is friendly and you are friendly. Courtney: We schedule hikes every weekend, most times both Saturday and Sunday, from spring through fall. In addition, there are mid-week hikes in the evening and impromptu hikes if a few of us have a day off. During the winter, we also hike on the weekend using snowshoes or Yak Tracs. Courtney: If you want to join us, please visit meetup.com/Concord-Walking-for-Your-fitness-and-Your-Dogs-Fitness and sign up. Membership is free. Please remember, you must be someone who likes to talk to other people and your dog must be friendly. AC: What is the most interesting thing you’ve learned through these endeavors? Courtney: I have lived in Concord about 25 years and only now am I discovering the great hiking trails (over 20 trails) available to hike and walk right in and around the Greater Concord area. All of the trail maps are on the city web site: concordnh.gov/index.aspx?nid=1033 and each one has directions to get there. Some are even marked with points of interest along the way. AC: Could you go into more detail about how your group operates? Could you talk about all the different dogs that join in on the fun? Do you have specific favorite places to go with the group/dogs? Any fun memories to share? Courtney: Hikes usually get posted 3-4 days in advance with details about how long it will take and start times so hikers can plan their day. I like to include a little history about the trail and how it came about giving credit to those who created such a wonderful environment for us to enjoy. We generally start at 8:30 or 9 a.m. when the trails don’t appear to be very busy at this time. With fewer people on the trail, the dogs have room to run and have fun. It’s interesting to see how they form a pack mentality after running together for only a half hour. They decide who they like to play with or chase in that time too. We have small dogs like Jack Russell Terriers and large dogs like Labs and Irish Setters, all breeds are welcomed, and mutts too! Depending on the group, there may be anywhere from 5 to 10 dogs on a walk. Several of the dogs like water and we do our best to find a vernal pool, stream or river for them to run in, especially in the summer. We always advise owners to pack snacks, treats and water for the dogs and themselves so no one runs into trouble. Walking should be fun but there is some preparation that goes into it to make it enjoyable for everyone. Some of the trails we have enjoyed lately are the Swope Trail off Long Pond Road. This walk is a quick hour and will get tyour heart pumping. It’s a shaded trail and Fall colors were beautiful from the overlook. Sewell’s Fall’s is nice and we most often run into other dogs in the early morning. My favorite is Oak Hill Tower Trail. Another heart pumping workout that lasts about 2 1/2 hours. We attract people from all over and people north of Concord find it convenient to come walking here, instead of having to travel further south to Manchester or Nashua. AC: What are your plans with your groups in 2015? Goals/events/new ideas? Courtney: We will expand membership and find new places to hike. I’d like to try to track miles next year and how people improve their fitness over the summer months. We had a few people who could not walk a mile when they started in our group and now they can hike 2-3 miles. We plan to continue walking around the year in all seasons. AC: What makes Concord special to you in terms of your passion? How about the members of your group? Courtney: A group of us was able to do the West End Trail which starts at The NH Audubon and runs to Carter Hill, an 8-mile (one way) hike on different terrains. It took some coordination for rides back to the trailhead but it was a beautiful day to be in the woods and well worth the effort. We learn from each other about different health issues with dogs, new products available, and healthy eating for both dogs and humans. To have access to these trails without having to leave the city limits is splendid. Courtney: Concord has so many trails, short and long. I encourage everyone to get out and try one. Join our group and get healthy while you and your dog have fun and socialize.